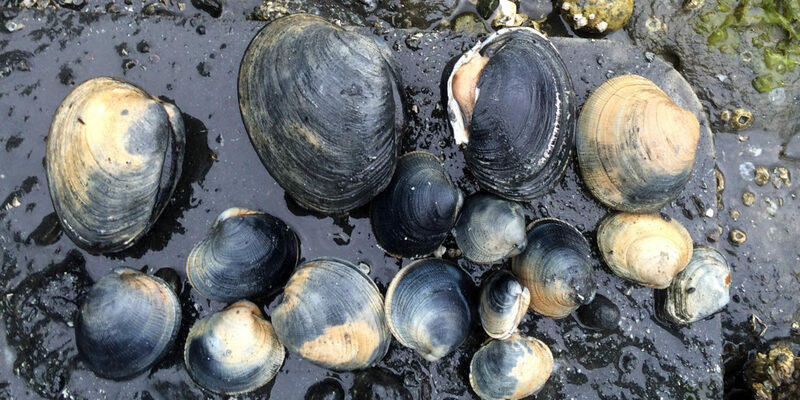 These and other species-specific patterns in intertidal clam populations were discovered by the Swinomish Indian Tribal Community’s Fisheries Department, the Skagit River System Cooperative (SRSC), and the Washington Department of Fish and Wildlife (WDFW). The research, published Dec. 3 in a special edition of Limnology and Oceanography on long-term perspectives in aquatic research, is based on 28 years of WDFW surveys. It is also the first exploration of its kind to look at large-scale environmental factors as potential drivers of hardshell clam populations in the southern Salish Sea. To describe these population patterns, the researchers used data on three native species of clams – native littleneck clams, butter clams, and heart cockles – from 11 beaches within five Puget Sound sub-basins from 1989 to 2016. What they found was evidence of population synchrony – a phenomenon characterized by populations of a species in different locations exhibiting similar patterns. “A more comprehensive understanding of population synchrony through space and across time can improve our predictions of how species or ecosystems may respond to different types of stressors,” said Julie Barber, Swinomish senior shellfish biologist and co-lead author on the paper. The three species of clams examined in this study are broadcast spawners, which means they release eggs and sperm into the water column. Their larvae drift in open water until they settle on a beach and bury themselves in the sand. As juvenile clams become established on the beach, they begin to grow to harvestable size, a process that can take several years depending on the species. It is during this time that the young clams are particularly vulnerable to environmental stressors such as temperature, salinity and food availability. Study authors evaluated the importance of seven potential environmental drivers of clam population dynamics and found that a large-scale oceanographic process known as the North Pacific Gyre Oscillation (NPGO) explains some of the variability in these clam populations. Large oceanographic phenomena have the ability to influence environmental conditions important to clam populations. For example, scientists know that the NPGO closely tracks changes in microscopic algae, an important food source for clams. The authors of this study suggest that NPGO-influenced food availability may be one factor affecting larval and juvenile clams, possibly playing a role in determining the biomass of adult clams. The authors also note, however, that there is likely a mix of large and small-scale drivers that influence clam populations. More research into these factors would be valuable. “All three of these species support valuable fisheries and fill important ecological and cultural roles,” said Lorraine Loomis, fisheries manager for the Swinomish Tribe. “Studies like these allow managers to consider which environmental factors have the greatest impact on our local clam populations.” For example, these results suggest that overfishing, shoreline armoring and non-native clam species are probably not driving the dramatic decline in native littleneck clams – insights valuable to shellfish managers. The research shows how traditional knowledge is linked with western science. Tribal shellfish biologists were first led to WDFW’s filing cabinets full of clam survey data after Loomis observed declines in the culturally important native littleneck clam population. For more information, contact: Julie Barber, Senior Shellfish Biologist, Swinomish Indian Tribal Community, 360-466-7315 or jbarber@swinomish.nsn.us.